Dean Smith overcame seriously limited track time on the final day of GP3 Series pre-season testing at the Circuit de Catalunya in Barcelona yesterday, Wednesday, 14th April, to produce an outstanding fourth fastest time during the last session of the two-day test. Marking only the 22-year-old’s second outing at the wheel of his Carlin-prepared car, the Racing Steps Foundation and Tomax-backed driver delivered an extremely impressive account of himself as he lapped in 1m37.918 seconds – just 0.2 seconds shy of the best of the session. 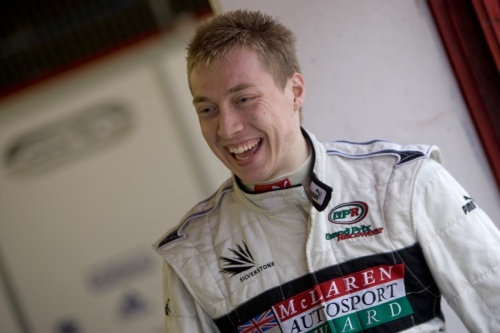 Although his preparations for the first two rounds of the 2010 GP3 Series in three weeks’ time were hindered by a major electrical problem, Dean was unfazed by the lack of running open to him and managed to end the two days an excellent sixth fastest overall on combined times. Underlining his genuine front-running credentials in the hugely competitive FIA Formula One World Championship-supporting category, the McLaren Autosport BRDC Award winner now returns to the UK ahead of the first event of the GP3 season in Barcelona on 8th/9th May. “Considering the amount of time we lost with the electrical problem, I’m really pleased with our pace and I’m sure we’ll be at the sharp end of things when the championship gets underway”, said the Wolverhampton racer, “Carlin did a fantastic job to get to the bottom of the problem and although we only ran for about the last hour and a half yesterday afternoon, we were really quick. On day one of the Barcelona test, Tuesday, 13th April, the track was damp during the morning which gave Dean his first experience of GP3 in wet conditions. Emerging as the best of the rookies, he posted the fifth fastest time of 1m38.925 seconds. Edging closer to the outright pace during session two, he improved to a lap of 1m38.016 seconds – less than 0.1 seconds away from second position. Practice for the first event of the inaugural GP3 Series will take place at the Circuit de Catalunya on Friday, 7th May, with qualifying and the first 30-minute race to be held on Saturday, 8th May. Round two will then follow on Sunday, 9th May, on the morning of the Spanish Formula One Grand Prix.